Take your air rifle hunts to the next level of knock-down effectiveness! The Dragon Claw's PCP power plant generates true magnum power and accuracy, with velocity up to 680 FPS and kinetic energy approaching 230 ft.-lbs. — better than a crossbow, and more than powerful enough to take a whitetail. It's an absolutely gorgeous gun, precision-machined to exacting tolerances with no rough edges, and the woodwork is beautiful. 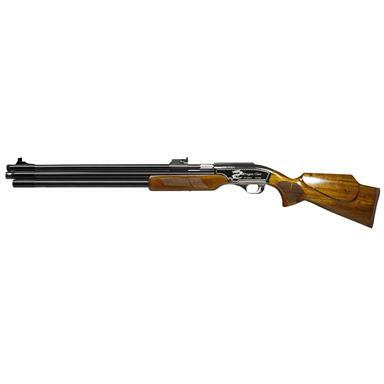 Seneca Dragon Claw PCP Air Rifle, Bolt Action, .50 Caliber, 21.60 Barrel is rated 5.0 out of 5 by 2. Rated 5 out of 5 by Kirk from Field test of the Sam Yang 50 Cal Dragon Claw. I topped my Sam Yang with a UTG 3-9X32 1" BugBuster Scope, The rifle is zeroed at 100 yards. I pressurize the PCP system with an Air Venturi Electric Compressor. I average 6 shots at high pressure setting before recharging. It has a report similar to a subsonic .22 long rifle round. No felt recoil and easy trigger pull. So far I have tried some of the Air Venturi projectiles and two of three styles grouped well but I am not seeing the kind of expansion I want to see.50 Cal, 336 Grains, Flat Nose was accurate and had best the penetration as well as expansion.50 Cal, 177 Grains, Round Balls were a little less accurate, had decent penetration but not what I am looking for.50 Cal, 185 Grains, Hollow points were not very accurate in my rifle. I had some pretty wide groupings but the expansion was great.44 Cal Hornady (.50 Cal Sabot) was by the far the most accurate round I shot. It had excellent penetration and grouped under 1 inch at 100 yards. Exact replica of the new Remington RP45 pistol.